What books did you give this Christmas? Books make great presents. I am very rarely given books, as people understandably have no idea what I’ve already got – but I did get one this year, Lucy Wood’s Diving Belles, a collection of stories I read about and immediately wanted to read. I know Amazon is the anti-christ to most independent booksellers, but I am grateful for their wishlist service and family members who read mine! I loved receiving a book, and am so looking forward to reading it. We are often asked on Facebook and Twitter and in the papers which books we would like for Christmas or which books we then received for Christmas. Less frequently do we seem to be asked which books we plan to give for Christmas. In many ways, a more interesting question! Not that many people probably give second-hand books as presents, but I am always encouraged by those who do. Why should our gifts always be outwardly pristine and shiny? Second-hand books can be wonderful in their own right; they can also be things that are not easily available new, and out of print books can be very exciting. 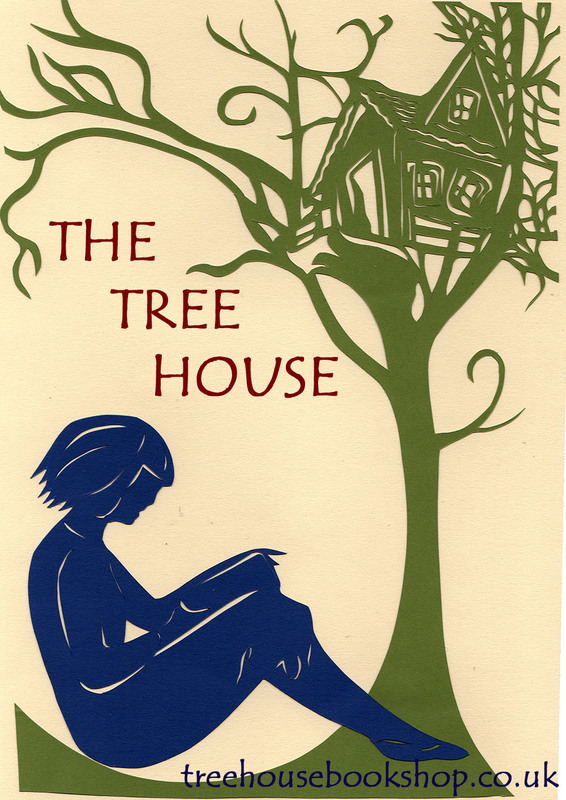 We had a number of people who did some of their Christmas shopping at the Tree House, and it was lovely to share their decision-making and their enthusiasm for finding books that friends and family were going to enjoy. I did some of my own there too, of course – if I want other people to support the shop, I should be supporting it myself after all! But it’s also good to spread the love for second-hand books. I gave each member of my family a book. A Harry Sidebottom Roman historical adventure, an Elizabeth Taylor novel, Raymond Chandler, Alexander McCall Smith, selected poems of TS Eliot and one of the lovely range of foreign fiction published in English by Peirene Press. Each was chosen with the particular person in mind, and that’s one of the things I love about giving books – it is a kind of symbol of the relationship between giver and receiver, a sense of how well we know one another and are interested in habits and tastes. Choosing books is great fun, and lots of people commented on how lovely it was to come to the Tree House in the run up to Christmas as even when there were quite a few people in the shop, it was peaceful and free of the mayhem in the bigger shops. There was space to sit and spend a bit of time browsing through selected handfuls of books. Some bought vouchers to encourage friends into the shop in the new year. My message here, amid the ramblings, is not to dismiss second-hand books as gifts simply because they may be outwardly a bit rough round the edges. It really doesn’t matter – it’s the content of the book that counts. Though even with a few rough edges – or sometimes because of them – second-hand books can be beautiful. And quite a number of the books we are given are in pristine or very good condition. Definitely worth a visit if you are trying to think of what to give someone for a birthday, anniversary, leaving gift, good luck gift, any occasion where a gift is a good idea. Boxing Day will mark the fifth month of the Tree House opening – sometimes it seems more like five weeks, other times it feels like a lifetime since we celebrated the opening day with a lovely evening concert of storytelling with Stephe Harrop and live music from Spicy Jazz. It’s been quite a rollercoaster, and nearly came off the rails, but here we are, facing the new year with improved takings, a strong core of loyal customers and supporters, and new people finding us all the time. We have just launched our twice-weekly film club, and I am hoping to create an increasingly full programme of events in 2014. Here are a few photos to chart our progress. It’s also fun to look back to the beginning of this blog and see how things have developed! A year ago the whole thing was just an idea, with a bit of moral support from friends and councillors – I didn’t imagine when I started the blog that by this date we would be up and running and doing so well. We are still not quite in profit – our overheads are crazily high – but we are getting there, which is marvellous. Have a wonderful Christmas and a happy new year, and thank you all for your support at whatever level – even seeing that people read this website is an encouragement! Let’s make the Tree House an even cosier, happier, community-enhancing place in 2014. We started a film club. We love Christmas at the Tree House. Serenity out of the chaos in earlier photos! Tara Behan and Matthew Hill, author and illustrator respectively of new children’s book The Legend of Everwinter, graced the Tree House with their presence on Saturday afternoon. Sadly there were no children in attendance, apart from a month-old baby who slept through most of it! But we adults who were there thoroughly enjoyed hearing Tara read the book and then hearing both of them talk about the creation of their first publication. I found Matthew’s discussion of creating the illustrations particularly illuminating (no pun intended, but it’s a nice one!). He is a hugely talented artist, and it has really added something to my appreciation of his illustrations to hear about the process of creating, refining and ultimately finding the right style for the story, as well as the technical aspect of creating and digitising the drawings. 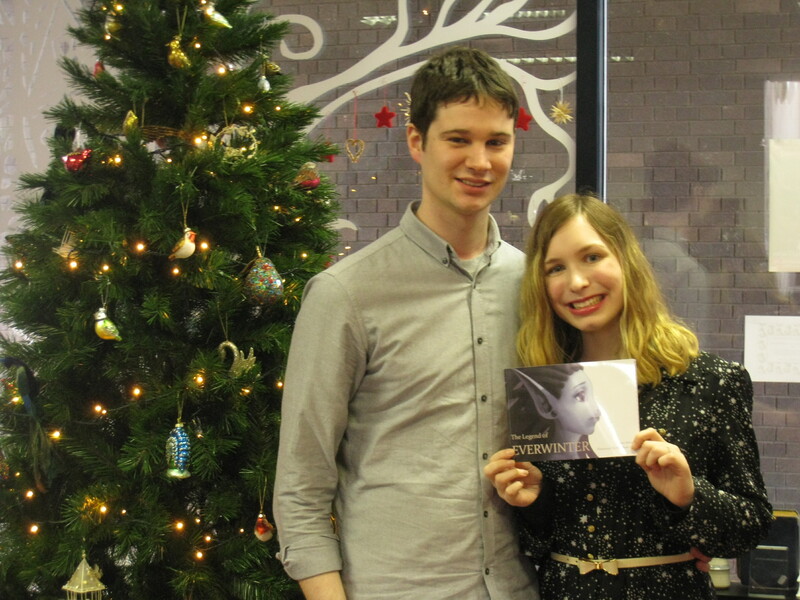 It’s a lovely book, and it was a sheer delight to have these two very lovely young people sharing it at the Tree House. We have a few copies in stock, so do come and have a look – lovely Christmas presents, a beautiful book to read with younger children and for slightly older children to read for themselves. But as Matthew and Tara said, the story and the illustrations (which each take up a whole page, opposite the text) both complement each other and also provide their own story – you can just follow the pictures, or follow the words, or let both interact. We also had another fine outing of the Sunday afternoon film club yesterday, watching It’s a Wonderful Life – I now feel that Christmas has started! We will be refining the whole process of showing and watching films as time goes on and as we accumulate more funds – it’s all fairly basic at the moment, but works very well nevertheless. We need a few more comfortable chairs, I think, and some blackout curtains, though while it still gets dark fairly early the latter is not too much of a problem – and the projected image is very good. Next Sunday afternoon film will be on 29th December (no film next week) and then on Thursday 2 January we will start our weekly evening films – rather more adult, eclectic films, with all sorts of plans for themed months and director’s seasons and the like. Please do email if you would like more information about the film club. Last but certainly not least – we have an evening of mince pies and other festive treats with a few carols on Friday 20 December from 7.30pm. I am thrilled that Will and Nicky Pound have offered to come and play for us – some of you will remember the wonderful evening back in August when they came and performed as Haddo. 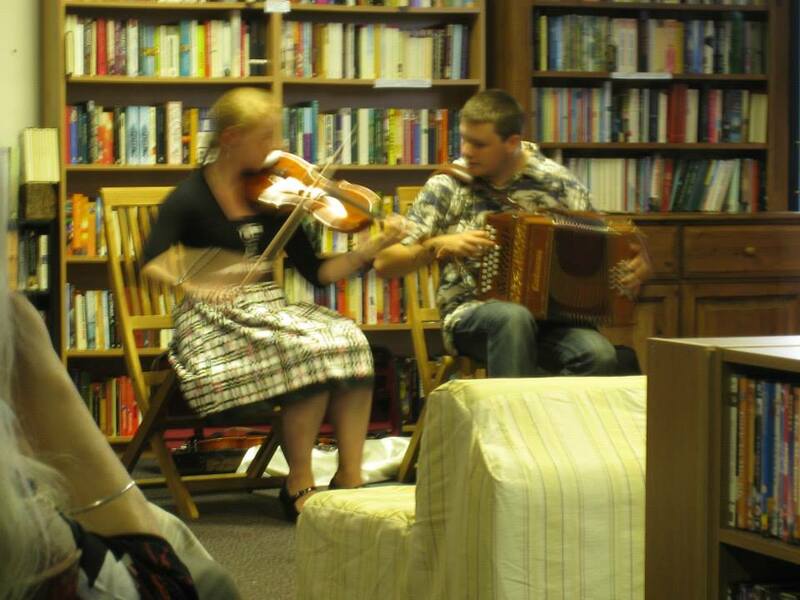 For those who do not yet know them, they are professional musicians, playing folk music and some of their own compositions – Will plays melodeon (and is a world-class harmonica player) and Nicky plays viola, and they are just fabulous. Exciting – please come! No charge, though donations to help support the Tree House in its infancy will be very welcome. The Tree House will have been open for five months on Boxing Day, and after a few wobbles is going well – something to add to the celebrations this Christmas! This Saturday, 7th December, is Small Business Saturday across the UK – a chance to promote and support small, independent businesses. The Tree House is, of course, a small, independent business! And would love your support. 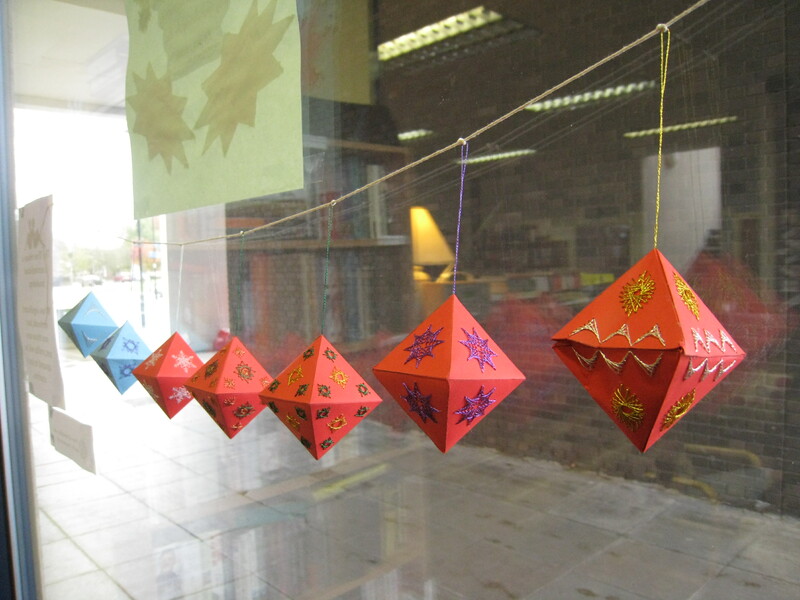 There will be a craft session with lovely Vicki Mansfield, who will be showing you how to make some excellent Christmas decorations – the sessions are £5, and you need to allow about two hours. Suitable for anyone aged 8 and over (including adults, of course! ), no need to book, just drop in. She will also be selling some beautiful straw star decorations she has made, and some of her fabulous embroidery patterns, which is the core of her own business, India Grace Designs. So do drop in and see Vicki. The Christmas decorations that Vicki will be showing you how to make. 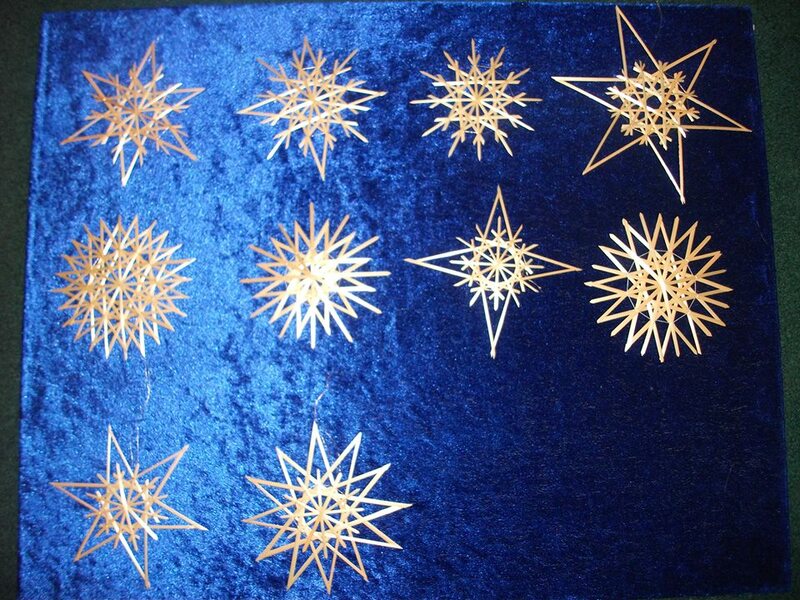 Vicki’s beautiful handmade straw stars, which she will be selling. We will be offering two for one on all Crime Fiction and Thrillers – perfect for winter weekends and evenings. We will also have mulled apple juice at 50p a cup – may not sound as exciting as mulled wine, but it’s very delicious and doesn’t affect your driving! We’ll also have tea and coffee, of course. We have a table of Christmas gift suggestions, and a few Christmassy books around the place, and the shop is increasingly festively decorated. So I hope lots of you will call in and support this little business, and the other small businesses in Kenilworth.